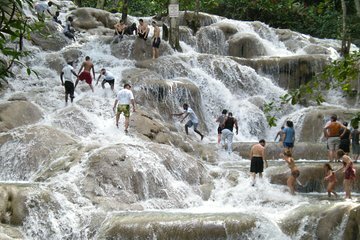 Visite las Cascadas del río Dunn y la Laguna Luminosa, dos de las maravillas naturales más famosas de Jamaica, durante esta excursión de día completo desde Montego Bay o Grand Palladium. Suba a las terrazas de las Cascadas del río Dunn con la ayuda de su guía turístico para las vistas panorámicas de los alrededores del paisaje rural. Deténgase para un tradicional almuerzo jamaicano (por cuenta propia), luego continúe hacia la Laguna Luminosa. Diríjase a las brillantes aguas a bordo de un barco; traiga su bañador para tener la oportunidad de nadar entre el inofensivo fitoplancton. Viaje con traslado de ida y vuelta incluido desde hoteles de Montego Bay y Grand Palladium. Amazing experience. Climbing the falls can be a challenging experience, but well worth it. Highly recommended. On the day prior to the trip I requested a complementary call from the hotel's guess relations to confirm the excursion for my family of four; Viator did not mention that I might have a problem getting in contact with the company in JA. to do so. I called three times (3) at a very busy CR desk which was very uncomfortable and not to mention that I received a call on my cell phone from said tour company the day before my trip requesting that I take the trip another day, ( like I was inconveniencing them with my plans) I had a great time at the Falls when I did get through to the company and confirm. My suggestion to travelers book your excursions at the hotel don't book through Viator it is not worth the trouble and inconvenience and the agents on Viator is also a problem to talk to they don't know what you will be dealing with once you book. We had a small group and this made for a fairly customized day. The falls climbing is not for the faint of heart. The luminous lagoon was interesting. we were 5 people in the car. three people picked up from Montego Bay hotel, they weren't ready, we were half an hour late. At Dunn's falls, we did not get any guide though it was paid for. when asked they said you have to pay for that. then one passenger lost his phone and we spent half an hour to find his phone, lots of waste of time. we reach very late at lagoon, not enough time there. we reach our hotel very late and missed dinner. The sites are not to be missed when in Montego Bay. With this trip, you are really just hiring a driver a great one, but still just a driver. Once you get to the falls admission is included in the ticket, you get another guide and proceed with a large group up the falls.. .slowly. i had hoped this would be a little more challenging but it really is a great experience. There is also a beach there you can enjoy. From the falls we had an option to eat lunch or go to the Blue Hole admission not included but we did not have time to do both. We chose to eat and then continue to the Luminous Lagoon. We sat at the the Lagoon for about 2 hours before the boat ride. This was not part of the plan. We did have time to go to the Blue Hole, I wish the driver would have picked up up two hours later to avoid just sitting around an overpriced bar. The Lagoon was also beautiful but I'm sure you can imagine after sitting around being bit by bugs for two hours, we were ready to wrap the evening up. The sites i would recommend, the logistics of the tour were not so great. 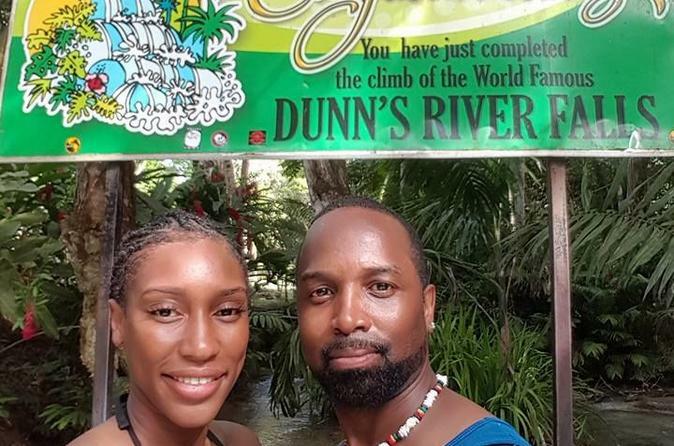 Dunns River was a lot of fun. Luminous Lagoon was pretty. The only problem is the "guide" for our whole trip. He was more of a driver who points out 1-2 buildings along the way. Because it was raining, he didn't even get out the car. He just gave us money and pointed to where to go. Terrible. Tour guide Lindsey was outstaying and mad our trip one to remember. I booked with and was very pleased with our driver for the day, Jermaine. He was professional, friendly, and gave us lots of information about Jamaica as we drove to/from Ocho Rios. The Falls are gorgeous! I didn't like that they wanted us to hold hands as we traveled up the falls, as I felt that I needed to use my arms for balance, to help shift my weight as I moved up the rocks, and to catch myself when I slipped, which happened often. Besides being asked to hold hands as we moved up, I loved the beauty of the falls and the guides were friendly, funny and were open to taking pictures throughout our tour of my family. I also wish that we weren't so rushed to get to the top, as once we started, we didn't have many opportunities to stop and really look at how beautiful the surroundings were. The lagoon tour was fun, as well. Our guide was funny and personable and explained how the lagoon glows in simple terms. I was surprised that only about half of the people in the boat got in the water to swim- my family did and it was a once-in-a-lifetime experience. My boys were a little scared about getting in the dark water, but our guide assured us that there wasn't anything dangerous in the water sharks/alligators and said that we should keep our feet up or expect to touch the mushy, muddy bottom, as the water is only about 4 ft deep where we get in. The water was warm and I never touched the bottom, but my husband and boys did and said that it was a weird sensation. My only complaint about this tour is that the professional photographer on board used his flash for every picture he took of my family in the water!! Of course, using the flash made our pictures come out looking as though we were in black water and none of the magical glow could be seen in any of our pictures- that was a disappointment, as we will most likely never be in water like this as a family again. I was really bummed about that. BUT, still loved the tour! !